Imagine if nothing was known about the Transformers beyond which toys they were and that the line started in 1984. Would it be enough? Imagine a situation where no one knew for sure if Optimus Prime or Fortress Maximus came first. Now imagine if nobody could agree that the Transformers debuted in 1984 and some peole believed it was '85 0r '86! The hundreds and hundreds of Autobots and Decepticons would be overwhelming chaos to comprehend without having some idea of the order they were released. This is the state of confusion that Mattel's Shogun Warriors exists in now. The numerous assortments of Shogun robots, monsters and vehicles sold over the course of the four years from 1977 to 1980 can be very confusing because unlike Transformers very little is known about the order these things were released. It's like having a family tree consisting of just a list of names but no idea of how anyone is related except that you know everyone's Japanese. Unlike a human family, when you're a Shogun Warrior someone may be taller than you but that doesn't necessarily mean he's older. This is why what I want to do is show not just when the line started, but how it unfolded and the context within which each figure fits. IT'S GONNA TAKE A ROCKET PUNCH SCIENTIST TO FIGURE THIS OUT! The most readily available sources of online information I could find to establish my chronology were the product assortment numbers off the boxes, the Mattel toy catalogs from 1977, 1979 and 1980 and my own collection of newspaper ads. I got product assortment numbers for almost the entire line just from pictures of Shogun Warriors toys on the Action Figure Archive and other various websites. The Mattel toy catalogs were over at Plaid Stallions and of course the newspaper ads come from my own Vintage Space Toaster Palace. I found each reference had its strengths and weaknesses. Assortment numbers were good for figuring out what waves of toys were grouped together but they didn't give dates of release. The toy catalogs showed what was scheduled for a certain year but didn't cover everything released and while the ads could definitively mark the dates certain figures were available, not every toy got ads. Once all these separate pieces of information came together the larger picture began emerging and although I still don't have it all I do have a better understanding of how the Shogun line evolved. Here then is the first half of my chronology of Shogun Warriors releases which encompasses 1977-1978. 1979-1980 will come later. 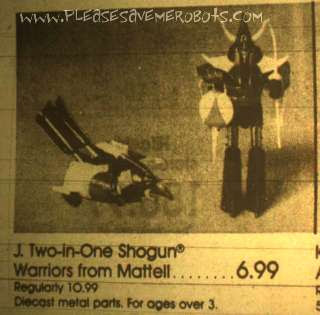 The 5-inch Shogun Warriors assortment appears in ads and Mattel catalogs every year from 1977 to 1979. The 1979 Mattel toy catalog showed retailers could order either cases of the same individual figure or an assortment with a mix of all four. The standard numbering pattern for Shogun Warriors had the combined assortment assigned the highest number. The 5-inch figure assortment was never expanded beyond the initial 4 figures and did not appear in the 1980 Mattel catalog. In 1978 Mazinga's name would change to Great Mazinga on packaging but his number and assortment would remain identical to the 1977 release. The first three giant figures were sold in individual case assortments and also in a mixed case. The 1977 Mattel catalog doesn't show a mixed assortment case number but it does appear in ads and it follows the standard numbering scheme where the mixed assortment gets the highest assigned number. Assortment 9861 lasted the entire life of the line but would see additions to and subtractions from this original lineup of three 23 1/2 inch tall figures. As with the five inchers, in 1978 Mazinga's name would change to Great Mazinga on the packaging but his number and assortment would remain identical to the 1977 release. 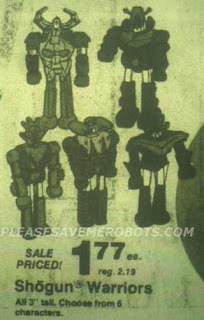 The mixed assortment 2518 was the only way to order the 3 inch Collectors Series figures, making them unique amongst Shogun Warriors assortments in that retailers could not order whole cases of the same robot. These toys are interesting because one blog claims the 3 inch line was "commissioned specifically by Mattel" and another states they were released "Late in the Shogun Warriors toy line life" which helps placing them in 1978. If true then this would make the 3 inch figures the only toys not based on pre-existing robot figures from Japan. I think it makes sense that Mattel would wait a year to order the creation of all new tooling once they were sure the brand sold well in 1977. I haven't totally discounted the possibility they were released in late '77 but I haven't found any proof of that. Since the assortment numbers did not change from year to year I'd say good proof of a '77 release would be any 3 inch package back that identifies Mazinga as just "Mazinga" and not "Great Mazinga". I don't know if that exists, though. The TWO-in-ONE label was entirely a Mattel delineation as these robots were originally from the same Popy GA series as the 5 inch die cast Shoguns from assortment 2107. While 2107 never saw the addition of any figures, the TWO-in-ONES assortment 2730 would be expanded on in 1979. The packaging of these figures touted their ability to change into two separate forms but Dangard and Gaiking required the removal of significant parts to achieve a transformation. Raydeen is historically significant because he's often cited as the world's first true transforming robot toy, with a very minimal amount of parts removal required in his change from robot to bird. Of all the vehicles released in the Shogun Warriors line, I've only found ads featuring the ones from the 2522 and 2734 assortments. At the time I write this there is an eBay auction for a sealed case of Sky Arrows showing that some retailers did indeed order full cases of individual items instead of the mixed assortment cases. The 2734 assortment would see the addition of two more vehicles in 1979 but the 2522 assortment would stay fixed at three. Two new giants joined the 9861 Giant figure assortment in 1978. The addition of Godzilla and Gaiking with product numbers in the 2440s showed how when Mattel would add new figures, the resulting new product numbers were very out of sequence from the rest of the numbers in the case assortments they were being added to. Godzilla was so popular he is often found in stand alone newspaper ads that make no mention of his status as a Shogun Warrior. 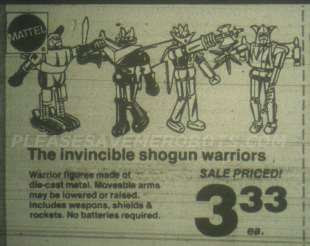 The ad here illustrates how retailers would often confuse line art of the 5 inch Shoguns with art for the 23 1/2 inch ones, but the text of the ad clarifies that this is indeed a solicitation for all five giants. Zargon and the Combatra U-Combine vehicles are numbered very differently from the other existing Shogun Warriors assortments and their product designations are close enough sequentially that I am grouping them together here. Although I have no proof in the form of newspaper ads or catalogs to show Combatra was a 1978 release, I figure the product numbers being in the same range of Zargon at least circumstantially supports a connection and I know Zargon was released in '78. That I have only ever seen Zargon in Sears ads makes me think he may have been exclusive to that store and if so I further suspect that the 2600 series product numbers may all be store exclusives. 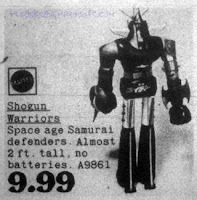 NEXT TIME: In the conclusion to my Shogun Warrior chronology I'll cover the fascinating sequence of 1979 additions to the product assortments and what the numbers say about possibility of a US released Jumbo Grandizer and TWO-in-ONE of that character as well. 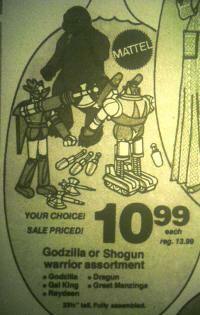 SO your saying Shogun Warriors started out the whole line with only two sizes of shoguns in 77? that's gotta be wrong! someone out there has to have a website proving thats wrong. is the 78 catalog online anywhere? Like I say, Shogun Warriors is not without fans who know what they're talking about, but the most credible sources of information about the toyline (John Eaton's Shogun Warriors page and Ted Terranova's site) don't state a definitive release dates for the toys at all. They instead preferring to approximate the releases as occurring sometime during the late 70s. I can see the wisdom in that but it sort of leaves everyone else to make up whatever they want to in regards to what came out when. So you're stuck with me and my version unless you can prove otherwise. I'm totally open to new info. And nope, I've never seen the '78 Mattel catalog online anywhere. It would be great to see because I'm dying to definitively know where Zargon and U-Combine Combatra fit. Hi - was trawling google looking for more Mattel catalogs for my collection, and the search threw me into this page of your site... 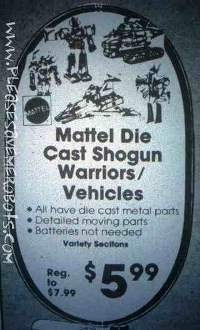 I have a 1978 German Mattel dealer catalog featuring Shogun if you would be interested in scans of the pages. Have been looking everywhere here for an email address to just send them to you, but you must have disguised it well. So will just leave this comment and check back in a couple of days to see if there's an answer. That's great! If you'd like to share the catalog the best person to email scans to would be KingboyD. He works on a site where they are assembling old toy robot catalogs from around the world. You can find his email here on this page. My blog gets such little traffic that your scans wouldn't be seen by many people. Thanks for helping out with the pages you have! Interesting to see an ad for a Combattra Zargon toy. 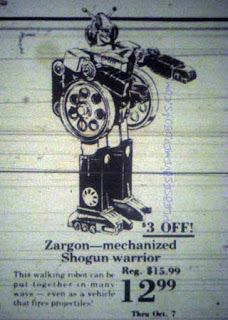 I'd heard of one, but have only ever seen Gaiking in the Zargon, Shogun box. Yeah, that ad tripped me out when I first saw it back in June and I concluded it's probably line art based off early promotional materials before the toy was finalized. I wouldn't consider it proof of an actual release at least until further actual proof of a Combattra Zargon pops up.